Item description: The Hillsborough Recorder of 18 May 1864 included this news item from the Richmond Enquirer of 5 May 1864. The excerpts are from letters describing a battle between General Stand Watie and the 1st Indian Brigade of the Confederate States Army and Union forces led by General John Milton Thayer in the western theater of the war. Choctaw Nation, March 30th, 1864. There is little doubt but this force, so roughly handled by Stand Watie, was a part of Thayer’s column. From the swamps of Florida to the praries of the Indian country, our successes run unbroken. Our Indian allies, under Stand Watie and others, who have never wavered in the darkest hours of our struggle, who have sacrificed their all to the great cause of Southern liberty, will ever be gratefully remembered by the people of the Confederate States. Item citation: The Hillsborough Recorder. 18 May 1864. Hillsborough, N.C.: Dennis Heartt. C071 H65. North Carolina Collection, Wilson Library, University of North Carolina at Chapel Hill. 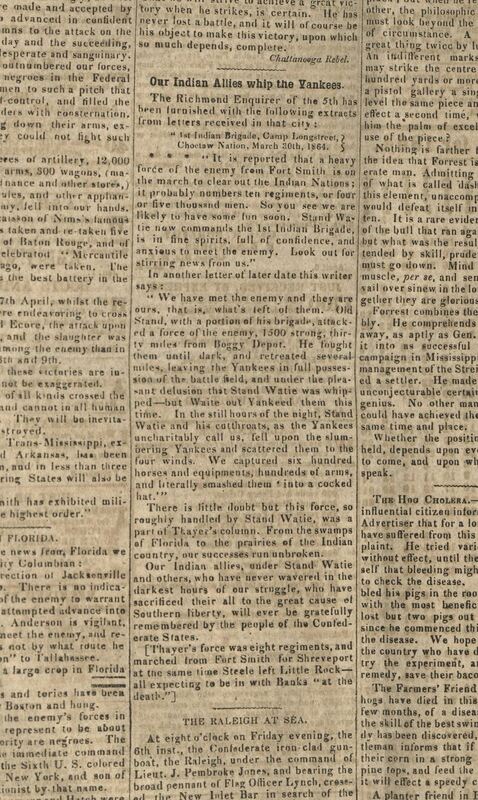 This entry was posted in North Carolina Collection and tagged American Indian soldiers, Arkansas, Boggy Depot, Camp Longstreet, First Indian Brigade, Fort Smith, Indian brigade, John Milton Thayer, Little Rock, Native Americans, newspapers, Richmond Enquirer, Stand Watie, The Hillsborough Recorder, Western Theater. Bookmark the permalink.